On SmackDown Live tonight, the New Day officially revealed that Big E was out with an injury. With no big man in their corner, an unlikely ally jumped in to fill the void. Last week, Big E was injured in a tag team match up featuring the New Day taking on The Bar and Raw's Drew McIntyre. Over the week, E made the official announcement, stating that he'd need some time off and would be away for a while. With Kofi Kingston now carrying the top title on SmackDown Live, and several targets on his back now that he's at the top of the mountain, losing Big E was bad news for more than one reason. However, on SmackDown Live tonight, another big man decided to step up and take his place. The show opened with the Kevin Owens Show. The Prizefighter was met with a nonstop showing of praise from the Montreal crowd, but had to cut it short in order to introduce his guests, the New Day. Eventually, after beating around the bush a bit, Owens asked if he could take over Big E's place tonight. 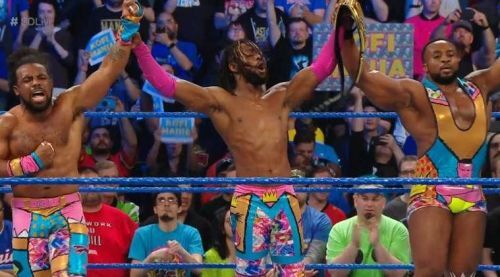 After all, Kofi Kingston and Xavier Woods were set to take on Rusev and Shinsuke Nakamura, and it was unknown what kind of pain and torture they had in store for the duo. While it took some convincing, Woods and Kingston eventually agreed to let Kevin Owens take Big E's spot. Later on in the night, the tag team match between the New Day and Nakamura & Rusev was changed into a six-man tag team match, adding Kevin Owens and Cesaro to it, respectively. With Owens, now known as Big O in their corner, The New Day managed to overcome the brutal brawling trio. Kevin Owens even got in on some classic New Day spots and took part in the Unicorn Stampede. Though he helped Xavier Woods and the WWE Champion Kofi Kingston defeat Rusev, Shinsuke Nakamura, and Cesaro, one has to wonder if there are ulterior motives to the former Universal Champion's actions. After all, he's not called the Prizefighter for nothing. Could he be eyeing Kingston's new title, or is this just a one-time thing?